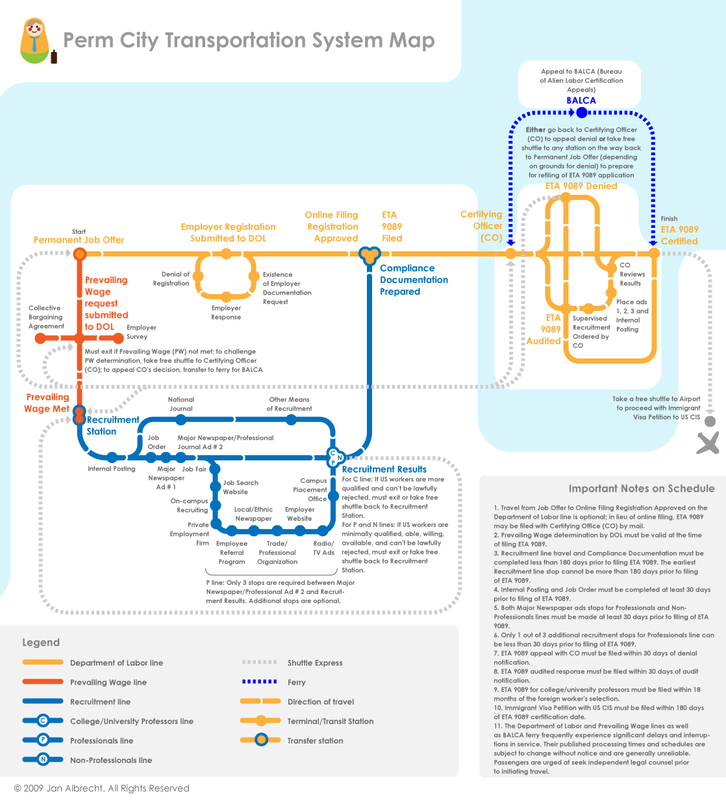 I must have worked on too many permanent alien labor certification cases that at some point I started seeing the new Program Electronic Review Management (PERM) system of the U.S. Department of Labor for what it really is: a clustered and congested urban transportation network. Except, unlike an actual transportation network, PERM (not to be confused with a city in Russia by the same name) does not run on schedule, its workforce is not familiar with the concept of customer service, and its technology is not evolving but, rather, devolving: What began as the equivalent to a high speed electric train has turned into a steam powered locomotive — loud noise, clouds of smoke, slow speed. The worst part, however, is that there is no map, just directions at 20 C.F.R. Section 656.17 plus a log of published decisions at the Bureau of Alien Labor Certification Appeals (BALCA), many of which read almost like cautionary tales for DIYs. Although I intended my map to be useful, I would still caution those actually using it to avoid navigating the permanent alien labor certification process as if it were a simple journey from point A to point B. The truth is getting from Permanent Job Offer to ETA 9089 Certified can be a daunting task, one that requires infinite patience, knowledge of detours and shortcuts, an uncanny sense of timing, as well as considerable skills at balancing two mutually opposed objectives. Especially since, having finally arrived to the end of the line, the petitioning employer may learn that its employee may be stuck there for a long time because priority dates for skilled workers, professionals, and other workers are hopelessly backlogged or simply unavailable. To estimate the wait in your preference category, you may want to check current priority dates and current filing dates.